WOW! and what detail and colour. V.
Superb shot Ali,Wonderful composition,colors and details..........V.
Very nice photograph, nice detail of the artwork. Those harmonious patterns in mosaics are very beautiful...nicely captured, Ali. 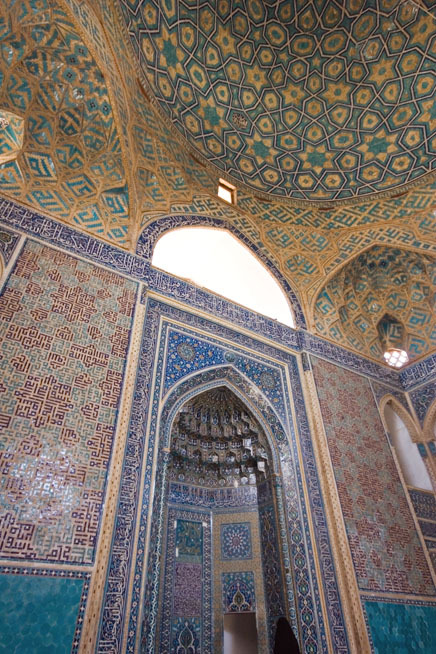 I just love this Islamic mosaic art!! Think you should just tune up the colors a bit more,but,...that's just a personal taste. Beautiful mosaic work well captured! Lovely colours. V! The intricacy of the dome's pattern is quite amazing. If you don't look closely, you might miss the complexity of the component elements. Your photo's vivid color and brightness make it possible to enjoy the mosque's exquisite beauty. This is really breathtaking. Beautiful mosaic work.